This is an aerial view shot around 1940 showing the heart of Chelidonia Bay. 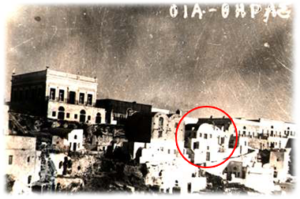 The white round arch building at the right side of the photo is now the Chelidonia Villas reception. Right below are the upmost two of our villas. In one of them the current owner was born. What once was the house of Triantafyllos’ great-grandmother is now our Honeymoon Suite. The oldest sales contract we have of one of the houses was closed in 1864. The Chelidonia Bay settlement as a whole dates back to some year between 1200 and 900 B.C, when Santorini was recolonized by the Spartans. The caves provide splendid isolation – cool in summer, warm in winter. From the terraces you can observe every ship movement all over the Caldera. During the earthquake in 1956 the large house on top of the bay collapsed like other flat roof luxury buildings. The round arch and cave houses of the average Oians all withstood . Ironically the damage came afterwards, when rescue workers poured all the rubble down from main street. From 1956 Chelidonia Bay lay deserted until we started our business here in 1979. We had to excavate the houses first. Now Chelidonia Bay should be the same again as our ancestors Nicolas Pitsikalis and Kapetan Manalis had perceived it. Manalis was exiled for notorious smuggling in 1890, a few years later he was on a official mission smuggling money to Cretan resistance fighters against the Turks. The archives of the Catholic Church in Thira list a Nicolas Pitsikalis as a “captain on his own ship” as early as 1628.